After reporting in my previous post that children did not get a discount on RTW tickets, I decided to check for myself once again. It was only writing it down that made me think “that really cannot be so”. The Star Alliance website clearly says that children do get a discount. And now the Star Alliance booking team agree and are going to refund the difference to us. They were nice enough about it; but I must admit I would have liked a more, well, grovelling apology after being over-charged $3000. The good news is that in sorting out the overcharge they also managed to find us space on the Singapore flight we wanted in the absolute first place. So now we are booked in for a 4 December departure. When we first started considering this voyage I began to research around the world airfares. It soon became apparent that a combination of our love of Singapore Air and the likely stops was going to take us with Star Alliance. They also have this rather nifty online system where you can plan out your stops, make changes, get quotes and book online. Given a history of bad travel agent experiences, I would much rather do my own planning where possible. Over the intervening months I have created and changed countless variations on itineraries. This process was not as simple as it might sound. The RTW ticket can only have 16 legs on it and different configurations of stops use up legs differently, and change the cost. Sometimes adding in a leg would bring down the cost (presumably because two direct flights are cheaper than one indirect one). Sometimes removing a leg or changing to a slightly different airport would put the cost up. So after a great deal of time and effort we finally settled on an itinerary. At the 23rd hour we made some final changes – adding in three more stops – and then we were ready to book. The first problem hit almost immediately – the first flight was now unavailable. OK, we could handle that, we moved it to the next day. But now I’m getting nervous, worrying I may have left the booking too late. So I start to make the booking online; and the nifty system does not work; simply refuses to allow me to actually make the booking. I email the Star Alliance help desk. Apart from getting three copies of my own email sent back to me I get no response for days and then an email asking me to phone an airline. I phone Singapore Air and have a deeply frustrating conversation with someone who has absolutely no idea what he is talking about and conveys that in broken English over a bad line. In frustration I give up. I try again online and get a step forward; but when it comes to the actual booking part of the process I get shunted to an email form. I’m getting mildly frustrated but it’s progress so I persevere and fill in the form. The next day I get an email response from Star Alliance in Germany (who I have to say have been unfailingly polite and helpful). The good news is they can make the booking. The bad news is, first, that we have to fly out 4 days earlier than we want and, second, that the price is $3000 higher than I have been quoted by the online system for the last 6 months. I query the price and am told that the online system mistakenly gives a discount for children that is not, in fact, available. Well that’s annoying (and with my lawyer’s hat on, probably illegal). So thinking that I should stop trying to do this myself and get professional help, I go to a travel agent. I hand him the itinerary and ask for a quote and to see if he can fix another issue which is that the online system would not let us book a direct flight from LA to Sydney; instead insisting on routing us through Auckland. Five days and several contacts later I’ve heard nothing from him. Then this morning I get an email from Star Alliance saying that the travel agent has made a booking and I now have two bookings in the system. This will lead to smoke pouring out of the system’s ears and bad things will happen unless I cancel one of the bookings pretty much now. The travel agent is closed on the weekend, so there’s an issue. Finally, it all becomes too much. I email the lovely German people. They strangely manage to find space for us on the flight we originally wanted from Sydney to Singapore. I take that as a sign and hand over the credit-card details. And there it is – we’re booked to go. I always thought that the first thing we would book would be the airfare. And we are getting close to that. But as we’ve done more research, we’ve realised that it is really important to spend Christmas somewhere nice. So, as we were still tossing up how much time to spend in Asia, we asked the boys – beach or snow for Christmas. They responded unequivocally – snow definitely. So we’re spending Christmas in Ruhpolding, in the German Alps, in this apartment. We haven’t told the boys yet, that we’re probably going to spend a year on this holiday. We’ve implied it’s just for Christmas. But Callum may well have his suspicions. It is hard to tell. Evan and I are inveterate travellers. We spent three months backpacking around Europe in the middle of winter twice, in our twenties. And while we lived in London for three years, we tried hard to see a lot of the UK and Europe. But we’ve not seen all that much of Asia. Which I’ve always been a bit embarrassed about, given it is much closer to us. And Australia is, increasingly, a very Asian country. We’ve both spent time in a few major Asian cities on business (Singapore, KL, Hong Kong, Tokyo, Seoul is the total list), but that’s not really a travelling experience (even if you do get to meet locals more than you would while backpacking). So we tend to think that we should have a fair bit of Asia on our itinerary. But we’re not that experienced with poorer countries. And the most interesting parts of Asia are the poorer parts. I started with Cambodia, because I’ve always wanted to see Angkor Wat. And a friend suggested Borneo, because the rainforest, and the animals you can see, are amazing. Everyone I know who has been to Vietnam has come back raving about it. Ever since I spent two weeks in Tokyo, I’ve been fascinated with Japan (these models of restaurant meals are just one reason). And of course, I would love to see the Great Wall of China and the Terracotta Army. And much of Asia is particularly cheap, compared with Europe or the US. While I’d love to go to Cambodia and Vietnam and Borneo, I’m hankering after Europe much more. And our chosen path around Europe (staying at least a week at a time in smaller towns and villages that are accessible by train) is surprisingly cost effective, at least for the level of difficulty. I often go for a bike ride around the harbour on a weekend. On Mardi Gras party weekend (the Mardi Gras for the first time had the parade and after party on different nights, due to a booking mixup), there were the usual wedding parties everywhere. I’d love to see a gay wedding on Mardi Gras weekend, but all I saw was painfully trendy young male couples, wearing their about town gear (saving the party gear for later that night). It’s a lovely cycle ride, and on a blue sky day like today, enjoyable even when you are dodging the traffic. There is always something to see and take note of, and lately I’ve been trying to do that with my dodgy iphone camera. So here are some highlights from today’s ride. 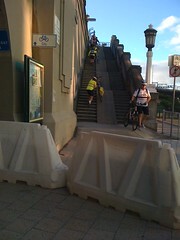 First, the Sydney Harbour Bridge cycle path. It’s a reasonably well signposted path on both sides of the Harbour Bridge, and was rated 9 out of 10 by Fairfax’s Sydney Magazine recently. But I can’t see how you can possibly rate it any higher than 6 out of 10 if you have to climb three flights of stairs in the middle. 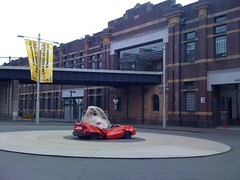 Next, we have the Walsh Bay sculpture walk. This one is my favourite, because it is so real. I’ve lost count of the visitors I’ve taken past it without comment, who are absolutely shocked at what has happened to the car. 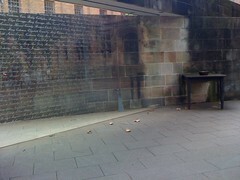 And a moving memorial to the Irish Famine. Between 1848 and 1850 several thousand young women, some no more than 14 years old, sailed from Ireland on an ill-fated emigration plan to hiring-out depots in Sydney, Adelaide, Moreton Bay and Port Phillip. Many were illiterate. Most spoke English. Few had domestic training. Known as the ‘Irish orphans’, they had been handpicked by government officials and removed from county workhouses grown horribly overcrowded as, year after year, the Irish countryside sank deeper into poverty, misery and disease. This memorial at Hyde Park Barracks is in their honour, and in the honour of all the people in Ireland who died in the Great Famine. 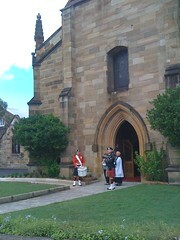 Sydney has a very strong Irish history, with one historian estimating that 25% of all people who came here in the 19th century were from Ireland, or who had Irish ancestry. It’s a subtle memorial, but I particularly like the empty bowl on the table – a reminder of the terrible hardships that would send people half way around the world from everything they have known. When we went to Europe last year, I joked that we were on the playground tour of Europe. But it is a great way to experience a country. You don’t necessarily meet locals that way (after all there is still a language barrier), but it is nice to be doing something the locals are actually doing. My favourite example of this wasn’t the best playground, but it felt like the most local experience. We stopped in Strasbourg for a night, to break the journey between Switzerland and Paris. Not too far from where we stayed was a nicely put together playground (near the Pont Couvert in Petite France). 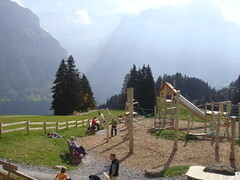 The most parent friendly playgrounds were in Switzerland, where most playgrounds had an associated cafe, with a complete view of the playground at all times. This particular cafe even served beer, as well as the hot chocolate we had all been hanging out for. Not every playground had a great cafe. This one in Murren didn’t. But the point blank view of the alps across the valley made up for it in scenic georgeousness. We adults were happy to while away a lazy half hour watching the boys play in the cubby house, and various other walkers come up and down the mountain. We knew that there was a cafe waiting for us 10 minutes walk away, so we could probably manage without a coffee for a little while. Many playgrounds are fairly generic – playground equipment from a factory that could be anywhere in the world. But my favourite spot wasn’t even officially a playground, even though we spent a very happy couple of hours there. 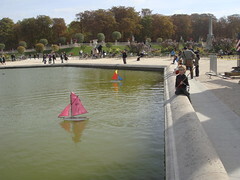 The Jardin de Luxembourg, in the middle of Paris, has a lovely octagonal pond. 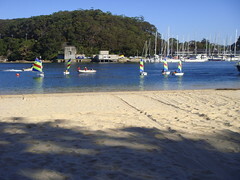 You can hire wooden sailboats there, which have masts that move with the wind. You also get a stick, which is fairly useless. So then you spend as long as your hire lasts chasing your boat around the pond, exclaiming when it crashes into other boats, having races with your brother, and generally exhausting yourself. It was enough fun that I was chasing as well, and a scene that just seemed to fit all my fantasies about what it would be like, living in Paris. So I highly recommend the playground method of tourism. Even in the most beautiful and touristy parts of town, it feels as if you are a small part of the local fabric. At that Alpine playground in Switzerland, Callum and Declan carefully diverted the course of the stream through one corner of the playground, together with three or four other children. I don’t believe they had a common language between them, but they had a wonderful time moving stones and mud together. Since I live in Sydney, and I love travel, I thought I’d post a quick post on top things to do here. A bit idiosyncratic, as we are a family that loves to walk. Nevertheless, here are my top tips. Walk across the Harbour Bridge (pedestrian side is the eastern side) – start at either Milson’s Point Station or the stairs up from Argyle St in the Rocks. While on the Bridge, you can climb up the South Pylon, which is almost as good as the Harbour Bridge Climb, and doesn’t cost nearly as much. 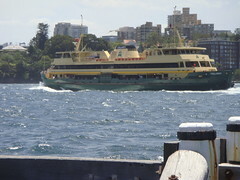 Spit to Manly walk – a 9km walk through bushland around Sydney Harbour – you can start at either end, and catch a bus to the other end – the best way to get to Manly from the city is a ferry from Circular Quay (which you should try and do regardless – a great way to see Sydney). Manly is also a lovely surf beach, bustling but not ridiculous on weekdays, with great snorkelling in Shelley Beach (which is a more sheltered part at the southern end). Berry Island is some of the most accessible aboriginal history from the city – a walk from Wollstonecraft station down to the island, and then a 20minute walk around the island with interpretative signage showing aboriginal carvings. From there, you can also walk to Greenwich (just slightly up the hill on the left is the start of the walk, and its reasonably well signposted), and catch a ferry back to the city. Wander around the Rocks (oldest settled part of Sydney) – fairly touristy shopping, but some lovely old streets and artifacts – visit Susannah Place museum for insiders information (although that costs). 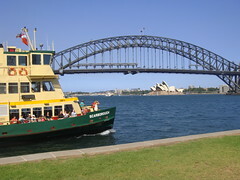 Catch a ferry (this is not free, but included in a public transport ticket) to McMahons Point to see the point blank views of the Opera House and Harbour bridge. 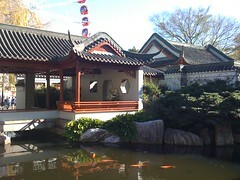 Wander around the Botanic Gardens – lots of special features, including the duck pond, lots of sculptures everywhere. In the middle, near the Tropical Centre, there are fruit bats living in all the trees. You’ll also often see possums, particularly near dusk (also unfortunately rats). My pick of the feature gardens is the herb garden, which also has a lovely sundial. Maritime Museum – this is free to get into (and it has pretty good displays) but it costs money to get onto the boats – my pick of the boats is the Endeavour replica – the Endeavour was the ship that Captain James Cook sailed in, when he sailed to Australia (first white people to see the east coast) in 1770. Art Gallery of NSW – the Canberra and Melbourne ones are better, but this is pretty good, and has some really interesting asian and aboriginal art. Chinese Gardens in Darling Harbour – a lovely oasis in the middle of Sydney, near Sydney’s ChinaTown – Sydney has a lot of people with chinese background, so this is one of the best chinese gardens you will find outside China itself (I’m told – I’ve not been to China yet). The Zoo – not cheap, but a fabulous spot, and pretty good selection of animals. You catch the ferry there. If you do go, definitely try and catch one of the shows – the bird show in particular is great, and free once you’re in the zoo. Blue Mountains – beautiful and quite different landscape – sandstone cliffs and escarptments. Scenic world is a tourist trap, but a fun one. You can catch the train up to Katoomba, Leura or Blackheath (although it is pretty slow). Fort Denison – an island in the middle of Sydney Harbour with a fascinating convict and military history. 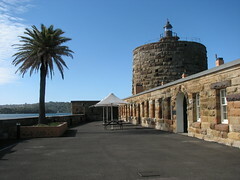 One of the few Martello towers in the southern hemisphere. Royal National Park – a day trip by catching a train to Cronulla, and then a ferry across to Bundeena (which is a lovely surf beach). Not a lot to do there, except walk, though. Two years ago, we had a three week holiday in Italy. Before we went, I checked out as much advice as I could find on travelling in Italy with children (Callum was 6, Declan 4 (and a half! I can hear him correcting)). Most of it boiled down to – forget it and go to a beach instead. But we had a wonderful time. Myth 1 – Children won’t enjoy “cultural experiences” – We saw quite a few “cultural things” – archeological sights, famous churches and cathedrals, even an art gallery. I think there are a few tricks to making this work. First – preparation and stories. Before we went, we had found some age appropriate books about the Romans to help us figuring out how to explain it all to the boys. They were particularly fascinated by stories of everyday life in Rome, which helped imagine what was missing at the Forum, and by anything bloodthirsty – the Colosseum, and the story of Julius Caesar’s assassination. Myth 1 – Venice is not a good place for children – I read this on a few travel websites. Really, what they mostly boiled down to is that you have to walk everywhere in Venice. We did our best to do a bit of training in the months before (we like to walk as a family anyway, but there was less giving in and carrying them on our shoulders than we had been used to). If you can survive the need to walk, Venice is the best city for children in Italy, possibly anywhere. We spent a week there, and could have had more. It’s very exciting having no cars, and streets full of water. The buildings feel much more child sized than anywhere else. The children can run around very safely in many places. Feeding the pigeons in St Marks Square is heaven for a four year old boy who loves animals. And best of all (at least from a small boy’s perspective) it flooded while we were there, which made it very exciting, watching everyone trying to pick their way through the floods, the traffic police directing the tourists on the narrow duckboards, and the water bubbling up through the drains. This book, Kids go Europe: Treasure Hunt Venice, had some great ideas and had us spotting wingled lions (the symbol of Venice) every where we could find them. Myth 3 – Italians love children – you will read this everywhere, even on non travel websites. I had been particularly looking forward to travelling with blonde Challum in southern Italy, as I thought that a blonde small boy would be irresistable to fawning shop assistants and waiters. To help, we taught both boys to say Grazie and Per favore before we left. But I don’t think we got any better service in Italy than we do in Australia. I think we got better service, often, than we would have without children (at least we got more smiles) but that’s true in Australia, too. A friend suggested that only angelically behaved children might trigger the fabled Italian fawning. Our boys are reasonable, but they do like to run around now and again, which often got frowns, and more often than in Australia, direct intervention, at least to the parents (quite fairly I might add). I think Italians are more interactive with children, and more prepared to interact with them directly (including correcting misbehaviour) but there doesn’t seem to be the same level of unconditional adoration that I had been subconsciously expecting. Perhaps at 6 and 4, they’ve outgrown their cuteness a bit too much. Myth 4 – Italians are manic drivers – Actually this one is true (especially in Sicily!). Of course there were a few downsides compared with that beach holiday, or with the holiday we would have had pre children. There isn’t much english language television in Italy, so occupying the boys when tired was a bit more labour intensive than it would be at home. We didn’t see as many adult “sights” as we would have without the boys. We’re still, a few days after coming home, in various states of jetlag. And, of course, from Australia, the beach holiday would have been much cheaper. But because of the children, our holiday felt more like an experience of another country, rather than the backpacker holiday that crams as many sights into a small period as possible we had done together 20 years before. We deliberately picked places and stayed there (so only three different places in three weeks) and tried to do as much as we could in each place on foot, rather than catching trains or driving anywhere. A year ago, we had an idyllic week in the Swiss Alps with Callum and Declan, joined by my brother. We didn’t find all that much useful information about travelling with children before we went, but had a wonderful time. We stayed in Wengen, a little car free village above the Lauterbrunnen valley. I love staying in places without cars, especially with the children. They can run around to their heart’s content without us worrying about them, and the quiet is amazing. The train up or down the mountain was every 15 or 20 minutes or so, which was plenty often enough when we were on holiday. 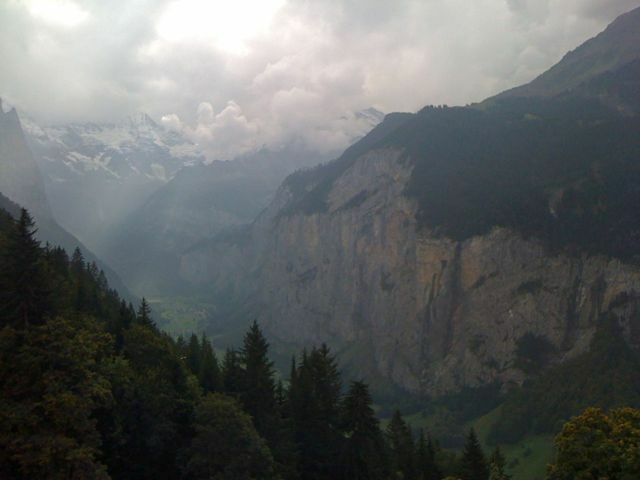 If I was going again, I would also consider Murren, or Lauterbrunnen iself. Evan and I love walking, and we have trained the boys into being happy enough to walk provided they get chocolate along the way – fortunately there is a lot of chocolate in Switzerland! Children’s adventure walk (also excellently blogged here). We caught the train to Murren (itself an adventure with a train, a cable car and then another train). 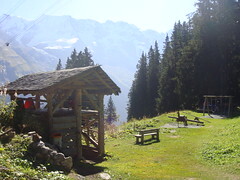 Then we caught a funicular railway up to Allmendhubel where we found parental heaven – a playground overlooked by a cafe. From the playground there was a well signposted walk back down the valley through a mixture of picturesque cow fields and pine forest, interspersed with various bits of playground equipment built out of the pine trees. As we emerged from the forest at the bottom of the walk there was another playground with views across the valley to the snowcapped mountains of the Eiger, the Jungfrau and the Monsch. There were also quite a few swiss cows along the way, complete with bells, one of which gave Declan a curious lick. Pfinstegg toboggan: From Murren, we took a train, a cable car, a train, another train, and then a cable car, to a little place called Pfinstegg. Although that sounds like a huge trek, it was a pretty easy trip, really – everything connected like, well.. a Swiss train. 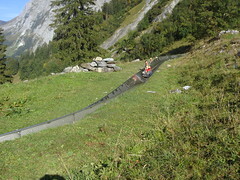 At Pfinstegg, there was a enormously fun summer toboggan run – if you really tried, you could get up to 40km an hour. Callum and Declan both had to go with an adult, and had a wonderful time persuading each adult to have just one more go… We adults enjoyed it a fair bit too. Also from Grindelwald, we had a second lovely day. A cable car up to the top of the mountain, and then a hike up to an alpine lake was a good combination of extraordinary scenery (point blank views of 3-4,000 metre mountains across the valley for most of the way) and easy walking. Then after walking back to the cable car station, we took the cable car most of the way back down the mountain to the Bort cable car station, and a Trottibike the rest of the way. A Trotti bike is basically a scooter with blow up tires, and good hand brakes. 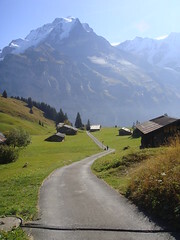 The Bort cable car station is 4.5km by quiet, totally downhill, roads from Grindelwald at the bottom of the cable car. Lots of fun by scooter (providing you have good brakes!). Before getting on the scooter we spent a very civilized hour at the Bort Alpine adventure playground, which (in what seems to be a pattern for Switzerland) has a bar/cafe overloooking it so the parents can watch the children in comfort. Another option on the same cable car system is the First flyer – a zip line ride from the top cable car station down to the next one. Unfortunately (and this is not on the website) you have to be at least 35kg to do it, and our boys are at least 10kg less. The one specifically children’s activity we found that we didn’t get time for was another children’s walk – the Felix adventure trail from Mannlichen, but I’ve linked here for completeness. The place we stayed in Wengen was a ski apartment – with better kitchen equipment than our house. Perfect for our little group. Here is a picture of the view from a walk nearby – on our first day, which was the only day with any clouds. PS apologies to any German speakers who read this – I have no idea how to type umlauts using this software.